One hundred years ago this past Sunday, Matthias Erzberger — representing the new German government — sat across a table from Gen. Ferdinand Foch, Supreme Allied Commander. They were in a railway carriage in the Forest of Compiègne, north of Paris. Accompanying Erzberger was Generalmajor Detlof von Winterfeldt, the only member of the Imperial General Staff willing to suffer the humiliation of defeat in person. 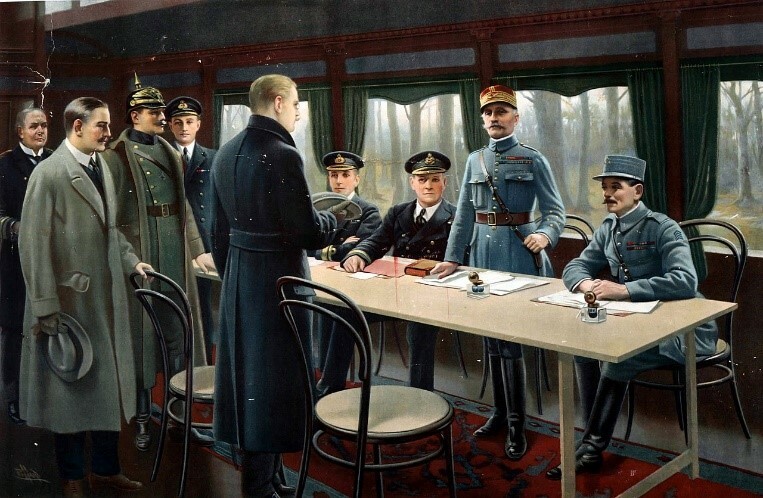 The men in the railway car signed an Agreement of Armistice — effectively, a cease-fire. Contrary to popular belief, this did not end World War I, which technically continued until 4:15 p.m. on January 10, 1920. The Armistice did not even end the fighting. Although frontline commanders were alerted by telephone and runner as soon as it was signed, many ordered their troops to continue fighting until 11 a.m., when it was to take effect. The most aggressive last-minute commanders were American. Thanks to them, U.S. forces suffered over 3,500 casualties that morning … even though the Great War was over. Glory … but Whose Guts? The American public resisted involvement in the war until German provocations — including submarine attacks on U.S. ships and an idiotic attempt to get Mexico to attack Texas — got out of hand. The U.S. finally declared war on Germany on April 6, 1917. The American Expeditionary Force (AEF) began to arrive in late spring under the command of Gen. John J. Pershing. Historians credit the AEF with turning the tide of the war, convincing the Germans that their cause was lost. For many of the “ambitious generals” in the AEF, however, by autumn of 1918 there was no time to lose. If they were going to make their mark and secure permanent promotion, they had to prove their aggressiveness. The morning of November 11 was their last chance. The result was an appalling and unnecessary loss of life. For example, the 167th Field Artillery Brigade of the 92nd Division — whose riflemen were all African-American — engaged the Germans starting at 5 a.m. Despite knowing that the cease-fire was to take effect at 11 a.m., their commanders ordered a final charge at 10:30 a.m. Advancing toward incredulous German machine gunners, who knew the war was over, they suffered several hundred casualties. The U.S. 89th Division, commanded by Maj. Gen. William M. Wright, found itself opposite the small German-held town of Stenay that morning. Wright sent a brigade to take the town. As they approached, a shell killed 20 American “doughboys.” Another 41 died storming the town. The Marine Corps, which had suffered greatly at Belleau Wood in June, was not exempt from this madness. Maj. Gen. Charles P. Summerall ordered the 5th Marine Regiment to force a crossing of the Meuse River that morning. Army engineers threw flimsy bridges across the water by lashing pontoons together and running planks over them. The Marines began to cross, with bodies of dead Army sappers tangled in the bridge. German shells spewed up geysers of icy water. Deadly Maxim machine guns opened fire on the Marines, easy targets slowly creeping single file across a rickety bridge. Six and a half hours later, the Marines cleaned out the last of those machine-gun nests. The Meuse crossings cost more than 1,100 casualties. At 9:30 that morning, the 313th jumped off across foggy marshland toward Ville-devant-Chaumont. At 16 minutes before 11 a.m., a runner reported that the Armistice had been signed. Two German machine-gun squads manning a roadblock watched, disbelieving, as the Americans began emerging from the fog. They fired short bursts over their heads, then ceased firing, assuming the Americans would have the good sense to stop with the end so near. But the men of the 313th had their orders. Baltimorean Pvt. Henry Gunther resumed his advance. The machine gunners waved him back, but Gunther kept advancing. The Germans reluctantly fired a five-round burst. Gunther was struck in the left temple and died instantly. The time was 10:59 a.m. when Gunther was last American killed in the war. Things were different in those days. American politicians were willing to question their military commanders … a far cry from the deference shown today. In the months after the Armistice, congressmen across the country began receiving letters from distraught constituents demanding an explanation for the loss of their loved ones on the morning of the 11th. Accordingly, they scheduled hearings. Republican Rep. Oscar Bland of Indiana took the lead. “How many generals did you lose on that day?” he asked Gen. John J. Pershing’s chief of operations, Brig. 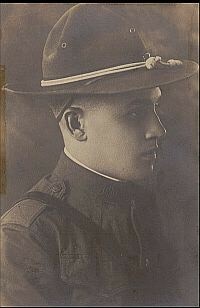 Gen. Fox Conner. In every war, the full range of human personality is on display. There are brave officers, and there are vain, cowardly officers. There are brave troops as well as cowards. But one thing is clear of every form of ground combat: The rifleman — the average “doughboy,” “GI” or “grunt” — is always the real hero.